To extend the versatility of PneuVibe Compaction Plates, optional clamping devices are available for Sheet, Pile and Post Driving attachments. 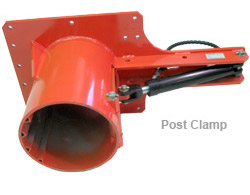 For post driving, the PD1 Clamp offers a simple but effective one person operation to pick up, place and drive posts from 50mm to 130mm diameter. This unit can be fitted to PneuVibe Vibratory Plate Models CP51 and CP100 and has a self locking mechanism in the event of pressure loss. The PD2 Clamp offers the same simple but effective one person post driving as the PD1, but this unit can be fitted to PneuVibe Vibratory Plate Models CP201, CP301 and CP400T. It has the capacity to drive posts from 100mm to 300mm diameter and has the same self locking mechanism in the event of pressure loss.